Poison, my first professional play as a writer/director debuted on stage last week. There are a million stories I can tell you about how it was made and in all likely hood it would make a wonderful collection of interesting tales but this post is about something else. 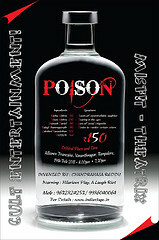 The experience of Poison has been for me akin to one of those coming of age movies. A story where the protagonist is doubted until he starts doubting himself and then in a moment of epiphany he makes a decision to take a random chance. A decision that brings him to a point of proving himself to the world and most importantly to himself. During this endeavor there were many who encouraged and challenged me. There were also those that poked fun and discouraged me and then there were a few that absolutely believed in me. But most importantly there were a few that stood by me right thru the entire process and gave me the strength and advice to complete this herculean task. I cannot lay claim to this task, there are many people without whom it would have been impossible to even comprehend completing this task. For now the two impostors stand side by side… But my task isnt done yet. Poison will be back soon. This entry was posted in Blogging, Theater, Thoughts and tagged Arts, Friends, Impostor, lessons, life, Rudyard Kipling, Tasks, Theater. Bookmark the permalink.